Step back in time and experience the life of yesteryear. With the African sunset as your backdrop, zebra and giraffe as your spectators, you can enjoy the sport of polo like never before. 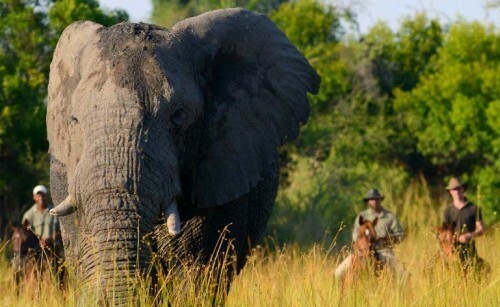 Embrace the unique opportunity and experience the ‘sport of kings’ on a private wildlife and wine estate in Zimbabwe. Sip a glass of crisp estate wine at the end of a day filled with horse safaris and thrilling chukkas of polo. Bushman Rock perfectly combines constructive, exciting and fun polo playing with absorbing and experiencing everything the African bush and lifestyle has to offer. With a combination of Arena Polo, Field Polo and theory lessons, guests will be able experience this wonderful sport in a stunning location. The team of experienced polo players will teach enthusiasts and inquisitive minds alike, making this package a must for both first time, green and experienced players. 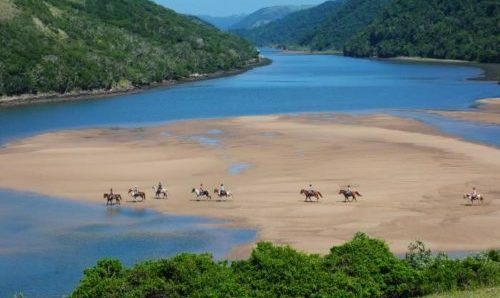 The all-inclusive package ensures everyone, no matter their riding ability, gets the opportunity to take part in this thrilling sport in the beautiful surrounds of Bushman Rock. 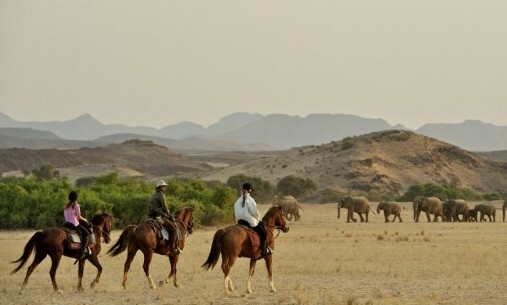 Beyond polo Bushman Rock offers the chance to ride alongside Africa’s game, take meals out in the bush, climb to the top of spectacular viewpoints and of course some well-needed down time around the pool. Sherri-Lyn was born into the very well-known Hensman family and it was never a question that polo would be a part of her life. At age-group level she showed such skill she was picked for the national Schoolboys team and has since represented Zimbabwe in all levels, including playing various test matches for the Men’s National Team. Having played off an International 2 goal handicap Sherri-Lyn was a permanent fixture on the professional Ladies Circuit around the world. While playing in countries such as Singapore, Jamaica and the USA she has gained a wealth of knowledge and her hard work was rewarded in 2011 when she was invited to take part in the Cartier US Women’s Open in Houston where she played for the Ralph Lauren Blue Label Team. Sherri-Lyn was recently named in the top ten ladies players of all time and represented Africa Ladies vs England and Ladies of the Rest of the World vs England. Sherri-Lyn has been coaching at Bushman Rock and in Zimbabwe for many years, and has taken over the coaching mantle at a national level from her father Garry (an international 7 goal player in his heyday). 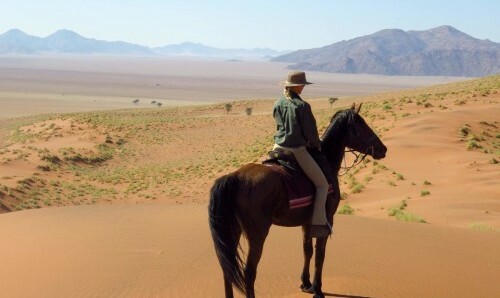 She will be on hand throughout the week to give one on one advice and tuition and will be leading the safaris and polo lessons. The Bushman Rock private vineyard and equine estate, situated in the middle of a game reserve a mere 40km outside of Harare, Zimbabwe offers unrivalled polo facilities and amazing beauty. Lying in the mystical Nyamasanga River Valley, Bushman Rock offers a unique combination of activities suited to a wide range of abilities and interests. From the Bushman Rock Cave exploration walks to canoeing; from tasting the private estate wines to playing polo. There is something for everyone nestled in the beautiful wildlife reserve. 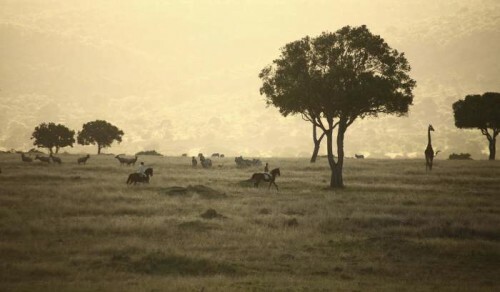 Best known for its stunning vineyards and picturesque surrounds, Bushman Rock has undergone a radical redevelopment in recent times with extensive replanting of the vines, the renovation of the original winery, and introduction of over 11 species of antelope into the game reserve and the installation of the equine and polo facilities. 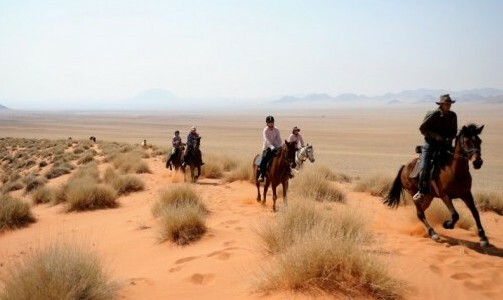 The itinerary is very flexible and can easily be tailored to suit different groups. For example, increasing or decreasing the amount of time dedicated to polo. There is also the option of adding in trips to the iconic Victoria Falls. Day 1: A Bushman Rock representative will meet you at the airport and bring you straight out to Bushman Rock. You will settle into your lodge and meet the team. Depending on your arrival time, you may be able to enjoy one of the many non-equine related activities available within Bushman Rock. Day 2: After a leisurely breakfast you will be taken down to the stables where you will meet the equine team. After a safety briefing you will mount up and head out for a morning horse ride. This very picturesque ride through the vineyard and up into the hills allows you to get to know your horse and helps relax travel weary bodies. A relaxed lunch served around the swimming pool and guests are able to swim, sunbath or catch up on some sleep before afternoon polo session. For beginner players the team will be on hand to give polo lessons and for the more experienced; a ‘stick and ball session’ on the polo field. After polo we will move down to the stunning Bushman Rock Winery where guests enjoy a tour of the winery, explanation of the wine making process and country specific practices, followed by a tutored wine tasting of the Estate Wines. A sumptuous three course dinner is served in the Winery. Day 3: Wake up to the sound of the dawn chorus and enjoy a delicious breakfast before heading to the stables to mount up. Spend the morning sticking and balling under instruction. After lunch, partake in constructional chukkas - spending a wonderful afternoon of fun and informative polo. You won't be able to stop yourself from grinning as your race down the pitch to the stunning backdrop of Zimbabwe, bathed in Africa's beautiful afternoon light. Day 4: Leisurely breakfast served on the veranda after which you will mount up and head out for an all day safari. You will explore the Bushman Rock wildlife area, crossing rivers, climbing rocky outcrops and cantering through grasslands. 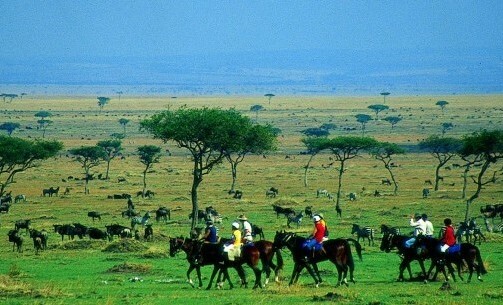 You may well come across any of the 25 identified species of antelope and wildlife during your safari. A sumptuous picnic lunch will be served in a secluded spot and after lunch guests will be taken on a tour of the Bushman Rock Cave Paintings. 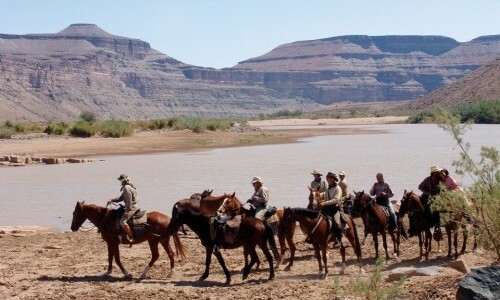 The safari will end at the dam for a cool down splash on the horses. Dinner is served at the lodge dining room and post dinner drinks will be served under the stars around the crackling fire. Day 5: Leisurely breakfast and morning stick and ball session. 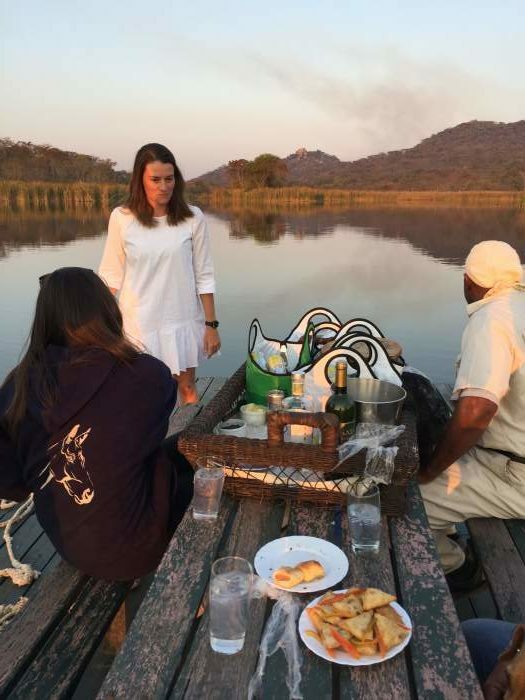 Afternoon practice chukkas and then guests are taken for a vehicle safari and a surprise “cultural dinner” served in a secret location. Day 6: Leisurely breakfast and morning stick and ball session. Afternoon practice chukkas. 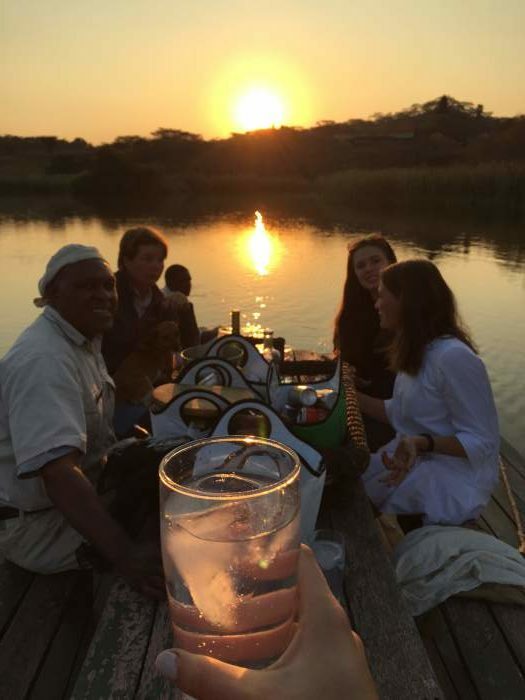 Enjoy a G&T on a sunset 'booze cruise' on the reserve's gorgeous dam. Day 7: Leisurely breakfast served on the lodge veranda. 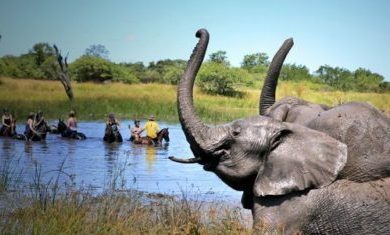 Guests are then able to partake in their choice of non-equine related activities: Vehicle safari, walking safari, canoeing, pontoon ride, fishing, vineyard tour, wine tasting. Light lunch served in the lodge gardens and an afternoon relax around the pool. Afternoon Polo Tournament—guests will be put into teams and will compete for the Bushman Floating Trophy. Evening spent at the Polo Club house with a traditional post polo braai (bbq). Day 8: Breakfast and transferred to Harare for onward travel. 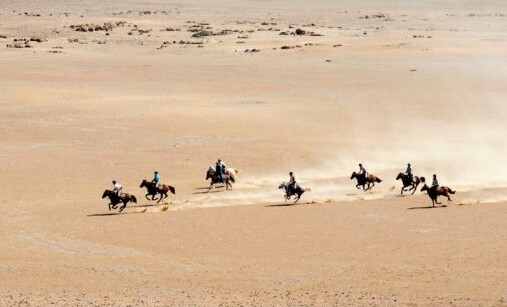 Horses: Hire of experienced polo ponies for the duration of the weekend as per the above itinerary. The horses shall be tacked and turned out as per Hurlingham Polo Association requirements. Grooms: Grooms shall tack up and untack your horses. Equipment: Provided— Polo Sticks. Helmets are provided although guests are encouraged to bring their own that comply with their countrys regulatory standards. Whips – These shall be provided only if the coach decides it is necessary. Transfers— if travelling anywhere other than to and from Bushman Rock and Harare CBD/Airport. Further onward travel can be booked at an additional cost if required. Insurance – guests will need to present proof of medical insurance that covers Polo and Horse based sports. Helmets, these are required under the PAZ rules and guests must provide their own where possible. Failure to provide a suitable helmet will result in the guest being required to use helmets provided by Bushman Rock for which we take no responsibility. Boots, Knee Pads and Polo Breaches – it is strongly suggested that guests come equipped with knee high boots and breaches/jodhpurs. Knee pads are suggested but not essential. Gloves – gloves are not provided and should guests feel these are necessary it is suggested they purchase a pair prior to coming to Bushman Rock. Tips – Although not included in your rates we do suggested that if you have been happy with your stay, you tip your groom and staff at the lodges. Any tips can be paid to the management at the lodges and a receipt will be issued for this. Guests are accommodated in the unique Bushman Rock Safaris Lodges where comfort and style are combined with homely hospitality and every guest is welcomed as a friend and leaves as a member of the family.